Haiku by Romano Zeraschi (Italy). Photo by myself. Romano san sends me a batch of haiku time to time, and just a few days ago, he sent a new batch. 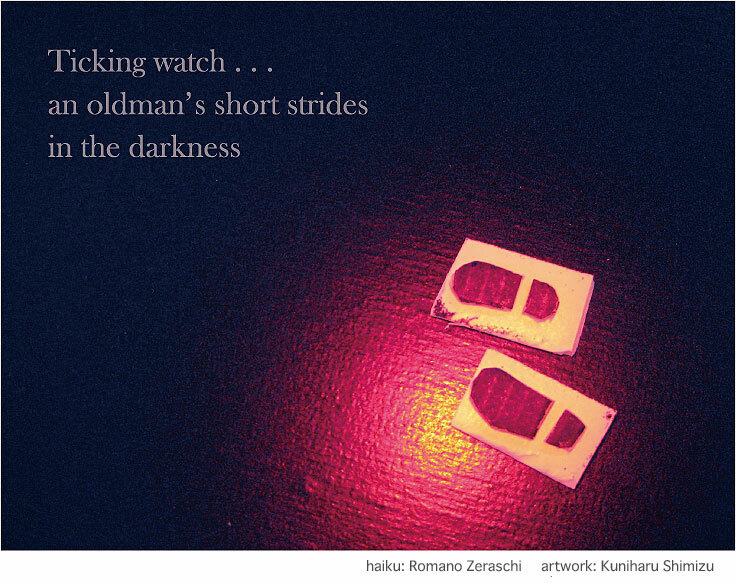 I selected this haiku (original was slightly different, but Romano san agreed with the change I made). At first I made two stamps of foot, and was going to make a footprints haiga. But, as I watched the handmade stamps, second idea came, which is what you see here. I really enjoy this verse. The photo shows great artistic creativity. Superb partnership of haiku and image.